← Does Canning Scare the Crap Out of You? That would be nice, but the closest I ever got to royalty was a story floated around by someone that we Tunno’s could be descendants of Albanian Royalty. I thought Albanian Royalty was an oxymoron, until I looked it up. Apparently, they not only exist, they have a website — and surprise — we’re not mentioned in the family history. I’m very put out. Every time I come around the corner, my clothes wait, probably taking bets on when I’ll finally break down and Iron. So, I’m stuck doing my own ironing and I hate it. My clothes have been silently mocking me for months. They were in a pile in my bedroom, but I moved them onto a chair downstairs thinking that would spur me to action. It hasn’t and every time I walk past them I imagine them making snarky comments. I come by my hatred of ironing honestly because my mom hated it too. The days I came home from school and smelled Clorox bleach, I knew she’d been doing one of her least favorite things — laundry. 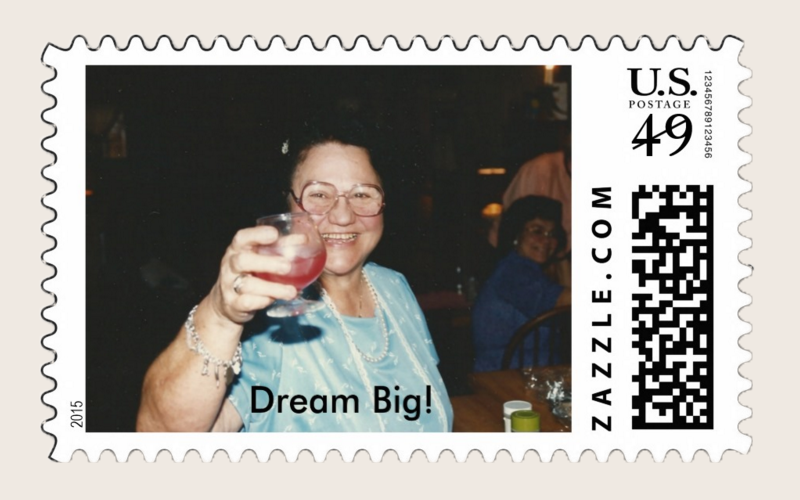 I remember her cutting brown Fels Naptha soap into little pieces and adding it to her favorite detergent, Tide. Fels Naptha was a 60’s version of a pre-soaker and stain remover. It’s also described as a skin irritant, something that, in retrospect, explains a lot. I’d glimpse through the breezeway window into the backyard and see crisp white sheets, work shirts and my father’s boxer shorts flapping in the breeze. The sheets had a roughness from drying outside that my sister hated, but I loved sandwiching myself in their crispness. It was wonderful, until the next morning when I realized I probably had nothing wearable. The first load was whites. The water was scalding hot and she poured the Clorox liberally. The problem was, she then re-used the hot Clorox water for the second load (the unfortunate, multi-colored clothes). The formerly bright, cheerful colors all took on a pathetic pallor once Mom got through with them. I remember the tragic sight of a favorite sweater, once a lovely light blue and the right size, reduced to toddler size in a sickening yellow. I longed for Kathy Pfleghar’s clothes. (You may remember, she lived across the street in Aryan perfection.) Her clothes were always impeccable. I remember looking in her closet once and sighing at the sight of four or five shirts, hanging – perfectly pressed, waiting to be worn. Laundry day was sad, but educational. As soon as I learned to wash clothes, I’d race downstairs at the first scent of Clorox to save whatever hadn’t been plunged into liquid hell. 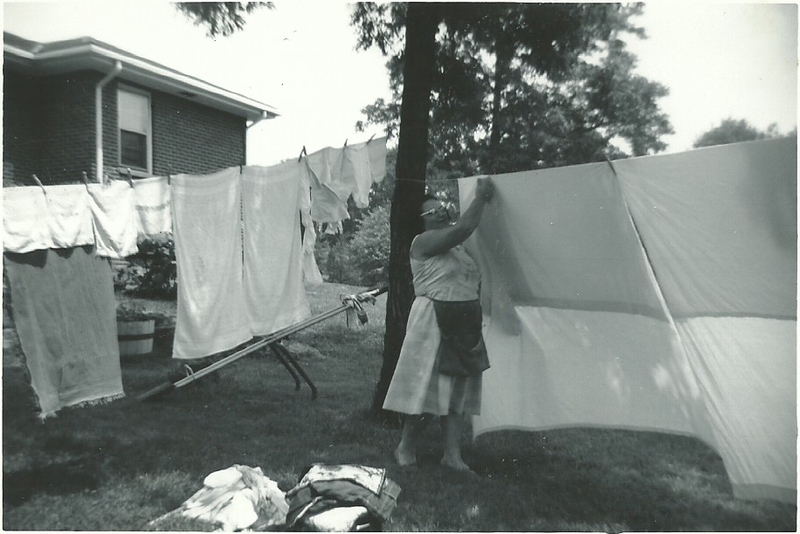 My mom may have only gotten to second grade, but she knew how to get us to do our own laundry very early. I started at six. Me in front row, just right of center, in the beautifully ironed dress with rows of black ribbon across bottom. 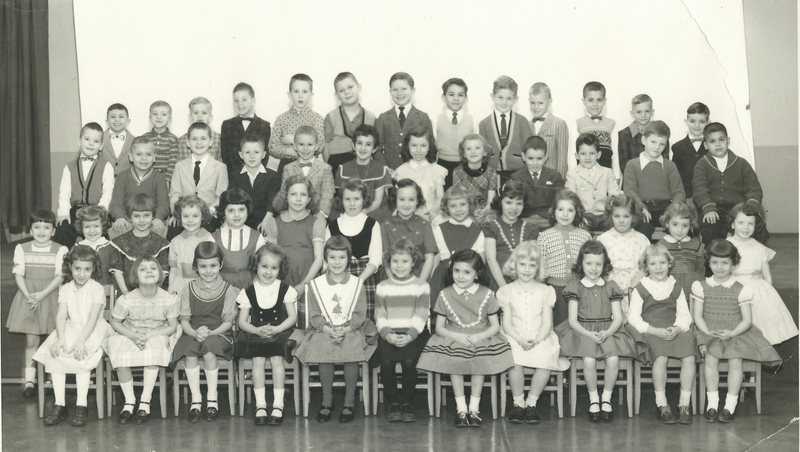 In fact, in my first grade photo from St. Joseph’s Elementary School, I’m in the front row, in a dress I ironed, wearing shoes I polished and shoelaces I washed, ready for my close-up. I remember spreading my dress out, so everyone could see my awesome ironing job. (Sadly, I said nothing, so no one knew I’d ironed it.) The ladies seating us forced me to tuck my dress in on the sides so the other girls wouldn’t be hidden by my overzealous skirt. The dining room table always had a sheet of clear plastic over it, which is mandatory in Italian homes due to non-stop eating. On top of the plastic sheet sat our clothes. Our dampened shirts and dresses were each rolled into a tight little cocoon, forming a pyramid of clothing whose bottom she rarely reached. Once clothes went into the laundry you could wait six months before ever seeing them again and they seldom came back the same. I found this Satina in my mom’s house years ago. I’m sure she bought it because it said it cut ironing time — yeah right. She had to dampen each piece because she was a compulsive starcher. 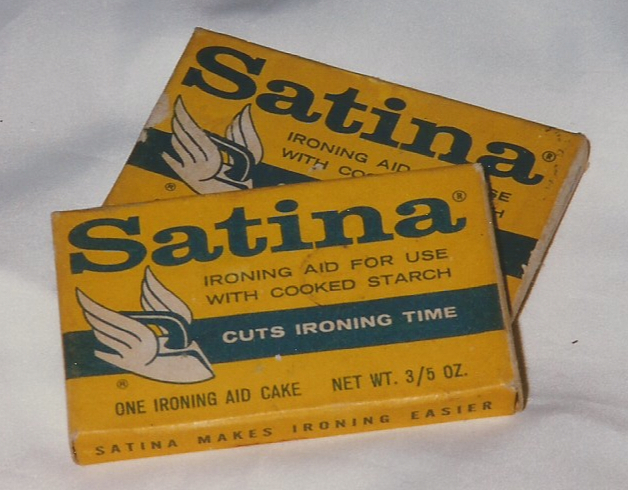 She made homemade starch with Argo Corn Starch, water and small, blue, waxy rectangles of Satina, which was “an ironing aid.” When I got home, it was my job to stand over a giant pot on the stove and stir the hot starch until the Sateena melted, then the starch was ready. Once they were washed, my mom used a thick dowel to dip shirts and dresses into the hot starch then put them through the ringer. Once dry, our clothes could stand up by themselves. Then she had to dampen them again so they could be ironed. In hindsight, I get why laundry was never her favorite. I remember her heavy arm moving the iron back and forth, the old wooden ironing board squeaking softly under the pressure. She pressed each damp, starched shirt, pausing at the most dramatic moments. She despised ironing and the only way she’d do it was sitting on a chair, watching television. I got home at three o’ clock and she’d be yelling at Jesse Brewer, the long suffering, sad-eyed wife of rat Dr. Phil Brewer, on General Hospital,“He’s a dorty rotten a skong, don’d a geeve een to him a!” But Jesse never listened. Yes, I am finally forced to iron tonight, but in mom’s honor, I’m going to have a nice glass of wine and binge-watch Netflix while I do it. Or maybe I’ll just put it off until tomorrow. 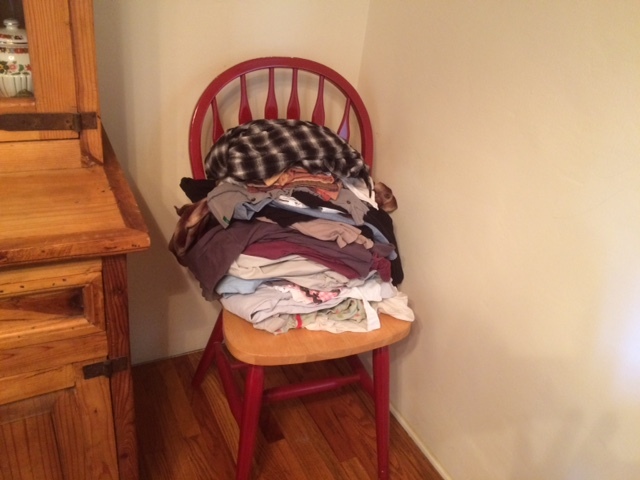 This entry was posted in Great Memories, Random Thoughts and tagged Clorox, clothing piles, Fels Naptha, funny, funny memories, hating ironing, Ironing, Italian humor, laundry day, Satina, serial clothing abuser, snarky. Bookmark the permalink. Bernie now has Donna, and I’m sure she loves ironing. You know, she’s so into the details of things, she probably does love ironing. Good for Bernie! And thanks for reading Chas! Boy does this bring back the memories, Fran! I cut my teeth on episodes of afternoon TV watching the beloved Jessie shedding tears over that louse Phil, as my mom toiled over the ironing board. Right after she watched Queen For A Day. I still remember the intro music to that show. My mom would wash all of my dad’s white dress shirts, then she had the trusty coke bottle with holes punched in the bottle cap, this was filled with water which was liberally sprinkled on all of the shirts, then the shirts would be rolled up and piled in the laundry basket, my mom would iron one or two of them and then grow weary of the thankless job, and in an effort to stave off mildew she would hide the shirts in the back of the refrigerator, theoretically to be ironed the next day (and to hide the guilty evidence from my dad). After a week or so she would drag the shirts out, they would no need to be re-washed, and the whole thing would start over again. Laundry was not one of my mother’s gifts. 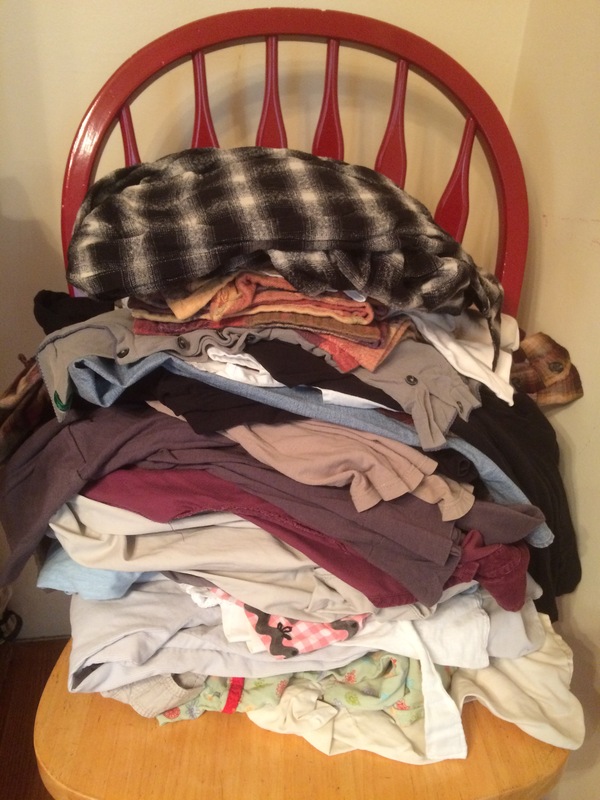 Like you, I experienced much angst over clothing that was put in the laundry basket and never seen again till it was ruined or I had perhaps outgrown it (and I was a small kid, so this tells you how long it took to get clean laundry in our house). I rejoiced the day that I began to do laundry for myself, and I have loved the task ever since. I iron my husband’s shirts and slacks once a week, while watching something jolly on TV. For myself I iron on an “as needed” basis. Laundry is instant gratification in my book. I’m extremely impressed with your ironing skills as a child. I would have climbed over shards of broken glass to be your BFF in the first grade. Oh My God Leslie, it’s like we were living the same life. Only my mom didn’t realize the thrill of refrigeration could have helped her put off ironing for a few more days. And she never used the coke bottle, pretty smart on your mom’s part. My mom used a pan of water and sprinkled with her hand. It makes laundry now look like playtime. No wonder they hated it! Please allow me to recommend a book title for you by Terry Ryan: “The Prize Winner of Defiance Ohio.” I think your mother would have loved to meet Terry’s mother, who is the subject of this heart-warming & funny book. (I will be returning the copy I checked out of the Glendale Library soon). I just watched the movie a week ago and loved it. Thanks for the recommendation George, I will check it out! Oh my goodness, Fran. You still have that look on your face sometimes! What a terrific photo and very impressive ironing job you did at that age. My grandmother taught me to iron by giving me practice on my grandfather’s handkerchiefs. Can’t really mess up a square… I am an anomaly to the Italian way of doing things. I do the laundry, put it all away, and then iron as I go. This does mean that I sometimes iron a small piece of cloth every day, but for a much shorter length of time. It becomes part of my ‘getting ready’ ritual. Probably very backwards, but currently working for us at the moment. Wow Nicol, I should do that too, then if I want to wear it, I have to iron it. But where’s the guilt in that? You looked so cute in that picture, . .it cracks me up. There are some things you almost have to iron, and I DO, not happily, . . but I do. Great memory, Fran. Thanks for the conscience-soother you provided with this Hate-Laundry column. Just a BRIEF glimpse of my view of that chore (brief as in short — not shorts) is next. While at the liquor store recently I bought 3 pairs of socks (at just over $1.30 a pair = a real bargain). The dozens of unwashed socks that await the laundromat (ugh!) will just have to wait another few weeks. (The laundromat TV plays only Latino soap operas, so binge-watching is not available as a comfort-distraction). Know this Fran, as a Laundry-Day Hater you are NOT alone. Thanks George for always reading and I feel your pain totally! I used to always make sure I had at least 14 pair of underwear in college, so I could go a full two weeks without having to do laundry. Now I’m thinking of buying more socks! Loved our first grade class picture! Can name almost everyone, can you? Did you realize that there are 50 kids in that picture and you know we only had Sister Mary Jacinta as the teacher. Can you imagine a first grade class today anywhere with 50 students and one teacher??? Also I remember you using Fels Naptha in the Forest Manor laundry room — I had never seen it before! Probably couldn’t carry your little paring knife around a dorm now either! Yes, I can. Thom Peluso has a Facebook page dedicated to St. Joe’s and it’s been so interesting to see what other people had to say about the nuns. I listed all the names there, only missed two or three. And I don’t remember using Fels Naptha in college AT ALL! How funny, I hated it and yet used it myself! I completely understand you and your mom’s aversion to ironing. Perhaps we can start a 12-Step group. My crazy mother even ironed SHEETS and PAJAMAS! Every once in a while I catch myself ironing a pillowcase and immediately feel the need for a visit with a therapist. That said: I bought a coveted Rowenta iron over a year ago. It still sits on the ironing board next to a pile of clothes (which I now need to rewash). I hope there is nothing wrong with the virgin iron, because I am sure the warranty has lapsed. Love you Linda! Yes, a 12 step — I’m in! But, yes, you do need a therapist if you’re ironing pillowcases. A virgin iron! This is one time when I’m rooting to keep virginity intact. Thanks Bern, it’s good to have backup on my stories!